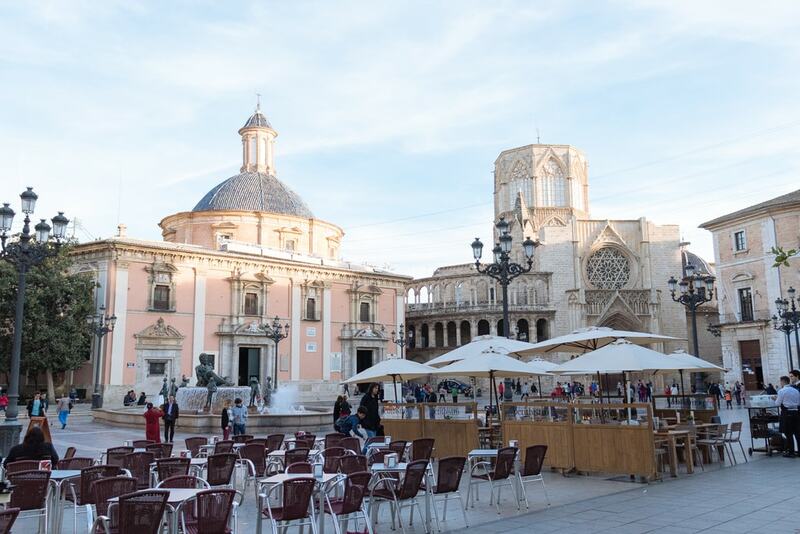 The Valencia region is undeniably unique, but did you know it has its very own style of Gothic architecture? 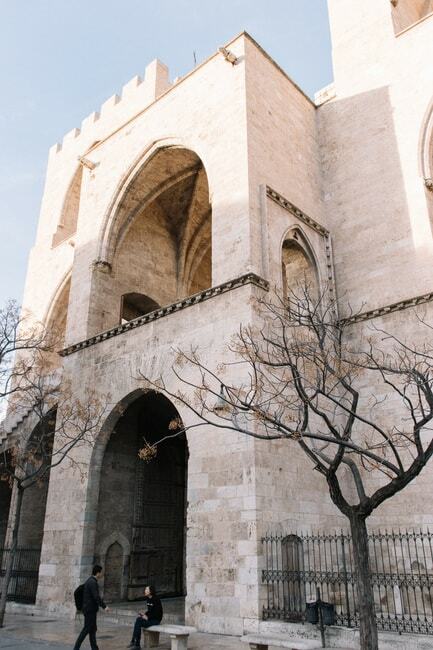 Valencian Gothic appeared between the 12th and 15th centuries and has special characteristics influenced by the city’s Roman past, as well as by Mediterranean construction techniques. Some of the city’s most beautiful landmarks fall into this category so, if you know a thing or two about architecture (or just enjoy looking at cool buildings), you should take the chance to check out these unique buildings on your visit to Valencia. Approaching the Old Town from the Turia park, you’ll see the impressive Torres de Serranos. This was one of the main gateways which made up the ancient city wall, or la Muralla Cristiana (The Christian Wall). At the edge of the northeastern part of the old city, the two polygonal towers give it a fortress-like appearance, with classical Gothic detailing on the central area. These towers can be explored and make a great vantage point. They also have an important role to play in the city’s main festival, Las Fallas; as the opening ceremony of the annual event takes place right outside. In the centre of the Old Town you’ll find one of the city’s main historical attractions. This medieval silk market was built by the Spanish Catalan architect Pere Compte, the grand structure intended as a display of Valencia’s wealth at the time of the booming silk trade. Today it’s famous as being one of the few examples of non-religious Gothic architecture in Europe. It has three parts: The Contract Hall, The Pavilion of the Consulate and the lavishly decorated upper floor. Elements of Gothic style are present throughout the building: from the facade covered in gargoyles to the soaring columns of the main hall. Understandably, it’s also a UNESCO World Heritage Site. Probably the city’s most famous landmark, Valencia’s Cathedral, Catedral de Santa Maria de Valencia, is probably most important example of Valencian Gothic architecture. It was built between the 13th and 15th centuries and, along with some elements of Romanesque, Renaissance, Baroque and Neoclassical art, the whole building is striking with its pronounced Gothic features. The western façade is notable for its ornate entrance and the rose window, while the interior boasts majestic vaults and the chapel of the Holy Chalice. 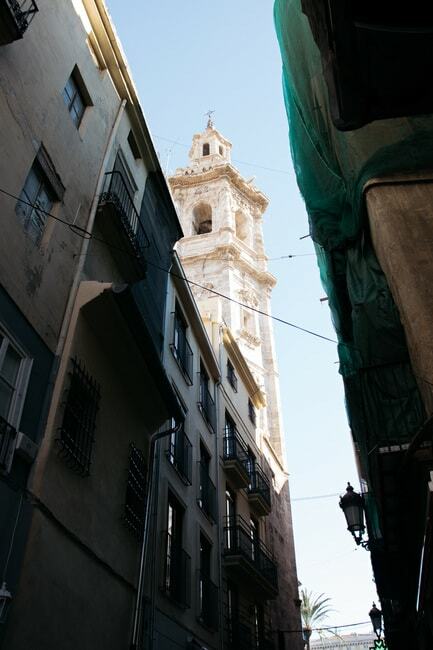 The cathedral’s octagonal bell tower stands over the old city with 206 steps to reach the top. Originally built as a separate monument from the cathedral, it features decorations and gargoyles at the corners in typical Gothic style. The top of the tower almost looks like there’s something missing as, unusually, there’s no cover over the bell. The planned top part was never built, as the construction was stopped and just never completed. Now the distinctive shape has become a symbol of the city. 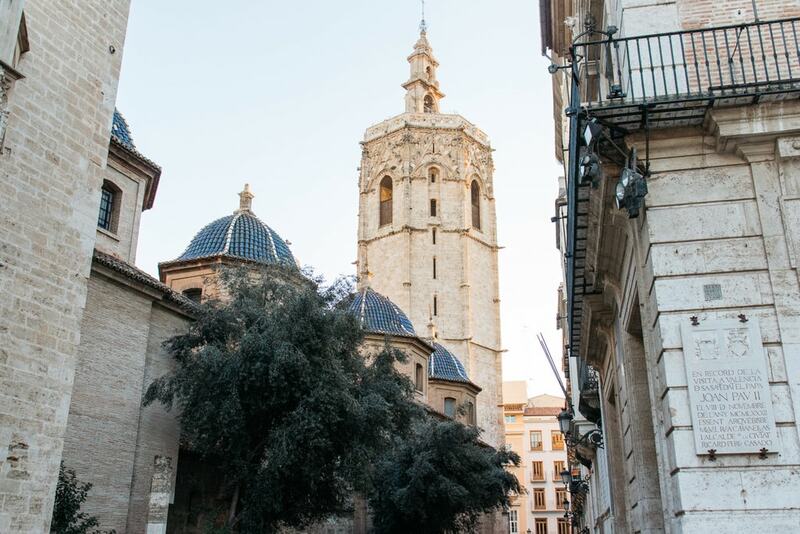 Not far from the cathedral you’ll spy the tower of the church of Santa Catalina (Saint Katherine), sitting in Plaça de Santa Catalina. Its tower blends a Valencian Gothic base with a baroque façade. A slightly odd but interesting fact – traditional Valencian folklore depicts El Miguelete and the Tower of Santa Catalina as husband and wife. In the heart of the old city, this palace is another gem built during the 15th century. Currently housing the offices of the local government, it’s an important piece of architecture as well as an important government building. 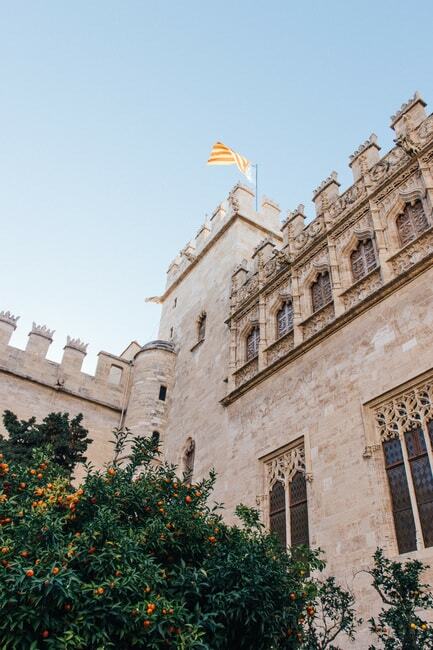 The building itself features a mix of Valencian Gothic style, Herrerian and Renaissance styles, with a tranquil back courtyard full of the area’s typical oranges trees.